A complete novice can be ready to run a 10 kilometre race in 12 weeks as long as he follows a proper training schedule. That’s only 84 days to get in shape, but it’s enough as long as a runner increases the intensity of his training gradually and does not do too much too soon. Certain rules must be followed, namely: don’t omit the rest days; stretch well before and after each training session; run some of the training sessions on grass; use energy drinks on the longer training sessions and if one week is too tough, repeat the previous week. Day 1: 10-minute session, walk for 1 minute and then jog for 2 minutes. Day 2: Rest. Day 3: 10-minute session, walk for 1 minute and then jog for 2 minutes. Day 4: Rest. Day 5: 10-minute session, walk for 1 minute and then jog for 2 minutes. Day 6: Rest. Day 7: 30-minute walk. Day 8: 15-minute session, walk for 1 minute and then jog for 2 minutes. Day 9: Rest. Day 10: 15-minute session, walk for 1 minute and then jog for 2 minutes. Day 11: Rest. Day 12: 20-minute session, walk for 1 minute and then jog for 2 minutes. Day 13: Rest. Day 14: 30-minute walk. Day 15: 20-minute session, walk for 1 minute and then jog for 2 minutes. Day 16: Rest. Day 17: 10-minute jog and then 10-minute walk. Day 18: Rest. Day 19: 5-minute jog, 3-minute walk and then repeat. Day 20: Rest. Day 21: 40-minute session, jog for 2 minutes and then walk for 1 minute. Day 22: 12-minute jog and 12-minute walk. Day 23: Rest. Day 24: 8-minute jog, 1-minute walk and then repeat. Day 25: Rest. Day 26: 15-minute jog. Day 27: Rest. Day 28: 40-minute session, jog for 2 minutes and then walk for 1 minute. Day 29: 20-minute jog. Day 30: Rest. Day 31: 5-minute run, 1-minute walk and then repeat. Day 32: Rest. Day 33: 25-minute jog. Day 34: Rest. Day 35: 25-minute run. Day 36: 20-minute jog. Day 37: Rest. Day 38: 5-minute run, 3-minute walk and then repeat twice. Day 39: Rest. Day 40: 25-minute jog. Day 41: Rest. Day 42: Race a 5-kilometre flat route or do fun run. Day 43: 20 minutes easy. Day 44: Rest. Day 45: 5 minutes fast, 3 minutes jog and then repeat twice. Day 46: Rest. Day 47: 25 minutes steady. Day 48: Rest. Day 49: 30 minutes easy. Day 50: Rest. Day 51: 35 minutes easy. Day 52: Rest. Day 53: 20 minutes steady. Day 54: Rest. Day 55: 10 minutes fast, 4-minute walk and then repeat. Day 56: 40 minutes easy. Day 57: Rest. Day 58: 30 minutes steady. Day 59: 5-minute run, 3-minute jog and then repeat twice. Day 60: Rest. Day 61: 35 minutes steady. Day 62: Rest. Day 63: 50 minutes easy. Day 64: Rest. Day 65: 35 minutes steady. Day 66: 5-minute run, 3-minute jog and then repeat twice. Day 67: Rest. Day 68: 35 minutes steady. Day 69: Rest. Day 70: 55 minutes easy. Day 71: Rest. Day 72: 30 minutes steady. Day 73: Rest. Day 74: 40 minutes steady. Day 75: Rest. Day 76: 5-minute run, 3-minute jog and then repeat three times. Day 77: 55 minutes steady. Day 78: Rest. Day 79: 33 minutes steady. Day 80: 8-minute run, 2-minute jog. Day 81: Rest. Day 82: 25 minutes steady. Day 83: Rest. Day 84: 10-kilometre race. Jog – Above walking pace; 50 per cent of maximum heart rate. Easy – Gentle jog; below 60 per cent of maximum heart rate. Slow – Conversational pace; 60 to 65 per cent of maximum heart rate. Steady – Comfortable but purposeful; 65 to 75 per cent of maximum heart rate. 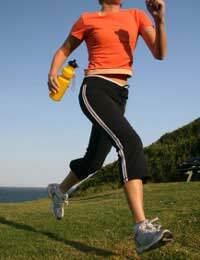 Strides – Fast bursts; 70 to 85 per cent of maximum heart rate. Fast – 5K to 10K race pace; 85 to 95 per cent of maximum heart rate.